The Montgomery County Animal Shelter (“MCAS”), today announced it has been awarded $275,000 in grants ($175,000 immediately post Harvey and another $100,000 today) from the Petco Foundation to support its lifesaving work in Montgomery County. MCAS plans to help many animals with this very generous lifesaving grant. MCAS plans to purchase a multipurpose mobile adoption unit for off-site adoptions, disasters, etc. In the coming year MCAS also plans to initiate public spay and neuter programs as well as other lifesaving initiatives. Access to spay and neuter is a paramount resource for the community. The community needs these lifesaving programs and should have access to low or no cost spay and neuter services. This grant means the world to MCAS and when MCAS was presented with the grant it literally brought many of us here at MCAS to tears of joy. We are incredibly grateful to the Petco Foundation. 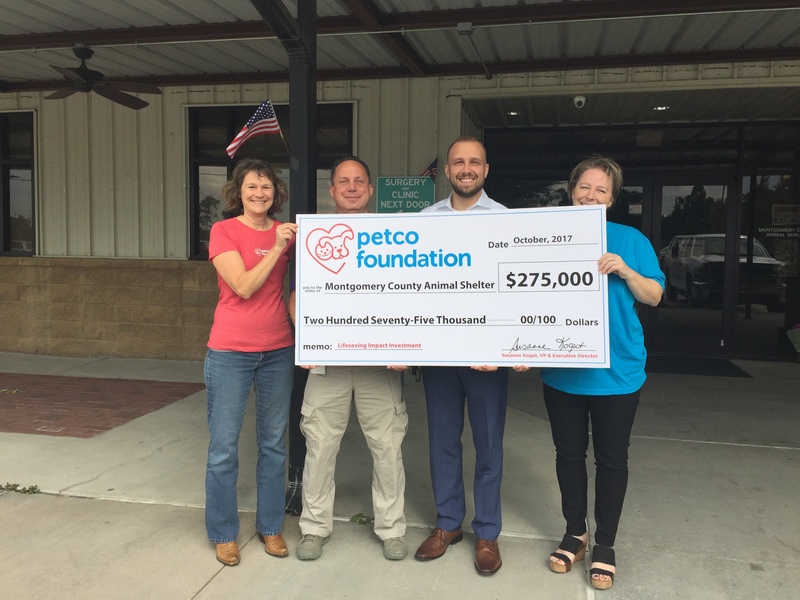 Pictured above from left is Susanne Kogut, Petco Foundation Executive Director, Mark Wysocki, MCAS Assistant Director, Aaron Johnson, MCAS Director and Susan Cosby-Jennings, Petco Foundation Director of Lifesaving, Programs and Partnerships. For more information about Montgomery County Animal Shelter or the Petco Foundation, visit www.mcaspets.org or www.petcofoundation.org. Join the conversation on Facebook, Twitter and Instagram or by using the hashtag #PetcoFoundation, #MCASPets. MCAS is Montgomery County’s Animal Shelter facility. At MCAS we are dedicated to engaging the hearts, hands, and minds of the community to help animals in Montgomery County. As such, we are devoted to the humane, efficient, high quality care of animals in our shelter. MCAS is an open admission shelter which is required by law to accept every animal that comes through the doors regardless of temperament, breed, health conditions, etc. Montgomery County covers over 1,000 square miles. We encounter many unique challenges in dealing with animals as we cover suburban and rural areas. At the Petco Foundation, we believe that every animal deserves to live its best life. Since 1999, we’ve invested more than $175 million in lifesaving animal welfare work to make that happen. Without more than 4,000 animal welfare partners, we inspire and empower communities to make a difference by investing in adoption and medical care programs, spay and neuter services, pet cancer research, service and therapy animals, and numerous other lifesaving initiatives. Through our Think Adoption First program, we partner with Petco stores and animal welfare organizations across the country to increase pet adoptions. So far, we’ve helped more than 5 million pets find their new loving families, and we’re just getting started. Visit www.petcofoundation.org to learn more about how you can get involved.